A barrier screen prevents accidental contact with hot glass or fireplace internals and can be removed if desired. A decorative front is used to overlay the face of the unit and achieve the desired end appearance of the fireplace, as well as cover unfinished edges around the fireplace border. The decorative surround is required to conceal the space between the outer edges of the insert and the inner edges of the fireplace opening. Optional surrounds can be used to accent a standard surround, giving the appliance a unique look. This liner kit from Napoleon has the basic materials you will need for venting your gas appliance. This kit contains a 20-foot double-ply aluminum liner with a 3-inch diameter. Also included are the deluxe rain cap, termination plate, and chimney flashing necessary for proper vent termination and weather protection. As with all of Napoleon's appliances and accessories, this kit features quality products made of durable materials. Order this kit to effectively vent your gas appliance. Napoleon knows that the size of your fireplace will vary and that you should not be penalized for this. After all, are you to blame if you have a unit that calls for pipes that are either larger or smaller than what is considered to be standard? Their 25 Foot Flexible Compressed Aluminum Gas Liner Kit comes with a 3 inch diameter, helping to insure that you have as much lining capabilities as you need while not being constrained due having something that has dimensions that are significantly different from everything else. This compressed gas liner includes 30 feet of 3 inch piping that can help you to install your ventillation system. This kit includes all that is needed to conveniently vent your fireplace while getting an efficient and effective lining for your chimney. Each kit comes with a 30 foot length of flexible pipe, aluminum lining, a rain cap, flashing, and a termination plate. 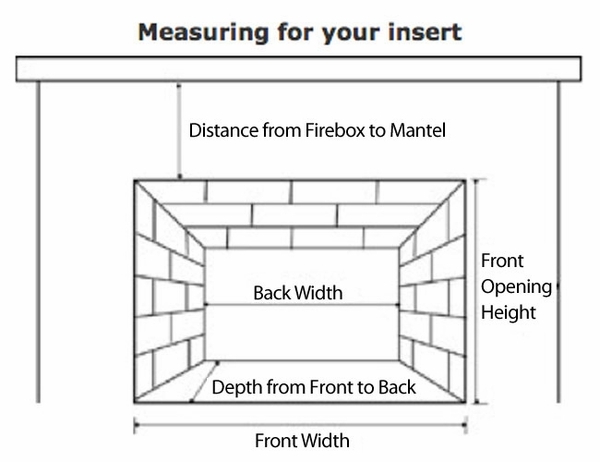 By following the included instructions, you can quickly install your vent and complete the installation of your fireplace. Included among the high quality venting products made by Napoleon. This flexible gas liner kit by Napoleon is for when you vent installation requires a gas liner. This gas liner is flexible compressed aluminum. The gas liner comes in a 35 foot length with a three inch diameter. Included in the flexible compressed aluminum gas liner kit are: one (1) double-ply aluminum liner, one (1) deluxe rain cap, chimney flashing and one (1) termination plate. *Venting Requirements: This unit requires venting pipe with an inner diameter of 3 Inches. Please see the Venting Components section on this page for venting pipe that must be used with this unit. * Please Note: You may also use a separately purchased cast iron surround or beveled flashing to complete installation.Shown with optional bay door kit, gold louvres, and porcelain green flashing. 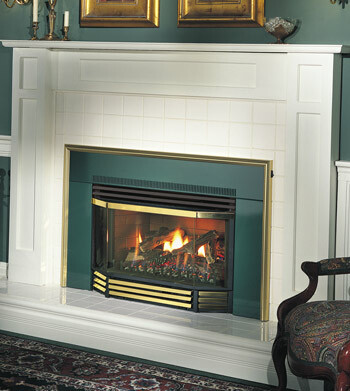 A Napoleon natural gas fireplace insert, measuring 25.5 "W x 17.5 "H x 16.5 "D fits most standard fireplace openings. The ceramic glass door provides safety while allowing a clear view of the contained, natural-looking fire. 24,000 BTUs of warmth, controlled by a circulating blower and automatic reset, keep the room at a comfortable temperature. An optional bay door will add dimension. You may purchase a cast iron surround kit separately. This insert will also require beveled flashing for complete installation. If you prefer propane instead of natural gas, you must specify propane on the order to receive a propane conversion kit. How many sq ft will this heat? Any hearth system featuring an open hearth will not provide efficient or measurable heating as too much air is brought in to the fireplace opening from the home for combustion and a majority of the heated air produced is simply lost to the outdoors. I recommend considering a direct vent insert if you are looking for efficient heating. Is there a maximum chimney height? My two story house has a chimney that might be as much as 35 or so feet high. There are no max chimney restrictions listed. What is the actual size of the viewing glass? The viewing area is roughly 12" by 20". Is there a remote control for this model? Yes, there are optional on/off and on/off thermostat remote controls available for this insert. These can be found in the "Popular Accessories for This Item" section on this page. Please note that this is indeed an "insert" and must be installed inside an existing fireplace. Is the remote control separate from the insert? Can I control the heat from my couch, which is 6 feet away? The remote is not included, but is offered under "Popular Accessories for This Item" on the product page in question. To answer your question, you should have no issue controlling On/Off functionality of the burner flame only 6' away from the insert. How does the variable speed blower work if no electricity is required? We apologize for the confusion. While no electricity is required for the burner in this insert, it is indeed required for the blower. Is this Napoleon fireplace insert for an existing masonry fireplace? This unit is indeed intended for installation into an existing masonry fireplace. Does this unit come with a fan or blower component to circulate heat? This unit does indeed come with a blower. 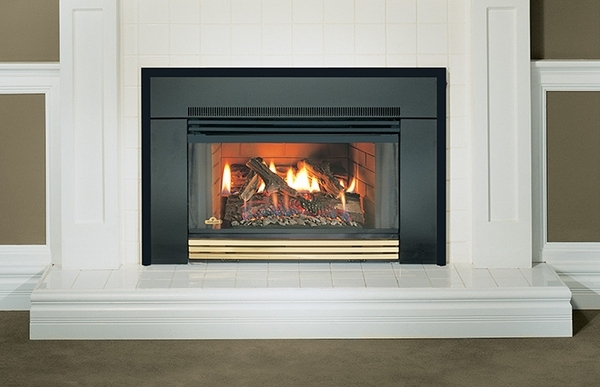 What is the size of the glass opening of this Napoleon GI3600 natural gas fireplace insert? The glass measures 11 3/4" H x 29 3/4" W.
What gauge of wire is needed for the electric plug for this Napoleon GI3600 natural vent gas fireplace insert? Should the line to the box be in-cased in metal? A 14 AWG or heavier shielded copper wire should be provided for powering the fan. Most brands will provide a 250 degree jacket, but using a coil conduit type of wire is fine as well. How does the blower operate if no electricity is required? Also, will a standard chimney sufficiently vent this unit? The blower does indeed require electricity for operation; the note regarding no electricity being needed is referring to the millivolt valve operation of this insert. It features a standing pilot that uses a thermocouple to generate the power needed to open and close the valve. So, no electricity is used to ignite the burner, but it is necessary for use of the blower. We apologize for this confusion. With regard to the venting, you will need a 6" diameter aluminum liner run up through an existing noncombustible chimney for proper operation for this natural vent insert. 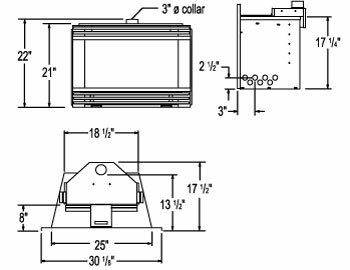 You can see the appropriate vent kits in the "Venting Components" tab on this insert's item page. When the Bay Window option is used, is the Bay Glass (item 36) used in addition to the Door Glass (item 16) or replace it? After checking with the manufacturer, they have confirmed that the bay assembly does still use the option of glass or screens. Whether glass or screens are used in the bay assembly, the primary glass pane must remain in position. With a 24,000 Btu heater, what is the maximum size of a room to heat? Assuming normal levels of house insulation and 8-to-9 foot ceilings, generally 35 BTUs will heat one square foot. As such, 24,000 BTUs will heat approximately 685 square feet. However, please note that this insert is open-faced and fairly inefficient, so much of the heat will be lost up the flue. 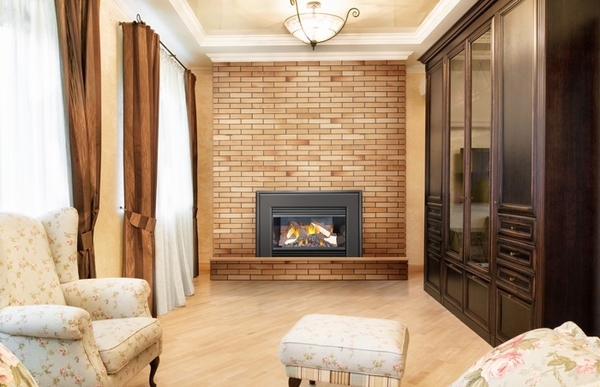 We recommend a direct vent gas fireplace insert for installation inside an existing fireplace. Everything arrived in good condition. Installation was very straightforward. The few gaps in the installation instructions were simple to figure out. The remote control was especially a breeze. Everything functioned properly on the first try. More than met my expectations. ProsCompetitive price, ease of installation. ConsBetter log placement illustrations would save installation time. Although I was cautious at first because of the price (many times cheaper does mean cheaper), I have to say I was not disappointed when using it.